30g deep clean - took a day, but it's done! Discussion in 'HCRU Crabitat's - Biography's Of Our Crabitats' started by emmac350, Nov 3, 2009. Hi all! Just redid the 30g tank...switched from sand to EE and made a bunch more changes! It took FOREVER, but luckily I didn't have anybody molting at the time (it's hard to schedule deep cleans if you have 8 crabs who seem to alternate when they molt; I can't imagine how it is for people with even more crabs, wow!) so it went over without too many problems. 0930-1000 - emptying coconut fiber out of upper levels, placing ornaments/extra shells/etc. aside for cleaning. Found 5 crabs in the coconut fiber/upper levels - Spaz, Toodles, Nibs, Rack, and Rocky. 1000-noon - sifting some of the bigger pieces of coconut fiber out of the sand, removing the sand by handfuls so as not to rough up any crabs I found (once all crabs were found, I started using an extra water bowl for a scoop). Found tons of those glass beads in the sand in various places...I had them at one point on the sand under and around the water bowls, but everybody loved burying themselves in that area, so needless to say, they didn't stay there. Found the final three crabs - Slightly, Curly, and Benny (in that order). Curly was REALLY weirded out by the whole ordeal, but he calmed down easily enough. Crabs spent the rest of the day in the exerciser - apartment humidity was about 50-60% the whole day due to the EE expanding, boiling stuff, and the fact that I live in the SE and humidity is pretty much above 50% every day. Noon-1300 - cleaning the glass of the tank, removing the last bits (as much as I could) of sand from the bottom. I got it mostly clean of sand, surprisingly enough. Used fresh water to rinse then a rag to absorb the water to "dry" the tank, then a vinegar rag for cleaning, then several times through with a fresh water rag until it no longer smelled like vinegar. 1300-1700 - husband was constructing the upper levels and I was expanding EE. 1 gallon of salt water in the tank + 3 bricks of EE was most of what I used; when putting the tank together in the end, I used just shy of another brick of EE. Boiled shells and boil-able ornaments, baked wood ornaments, and soaked the rest in salt water. (I had 4 gallons of salt water ready and waiting for this). Had dinner at the end of this, hence the break before next time group. 1800-1930 - tank setup. So exciting to have new ways to house the crabs, and the EE looks awesome. The new upper level supports make the tank look rather Teenage Mutant Ninja Turtle-ish in my and the husband's opinions - and Rocky and Spaz will be able to fit in them for pretty much the rest of their lives. Spaz decided to dig again last night...maybe someday he'll use my awesome stuff. The crabs (well, 6 of them) have been REALLY active today. Seriously, they've been up all day, just exploring. They seem to really like it. 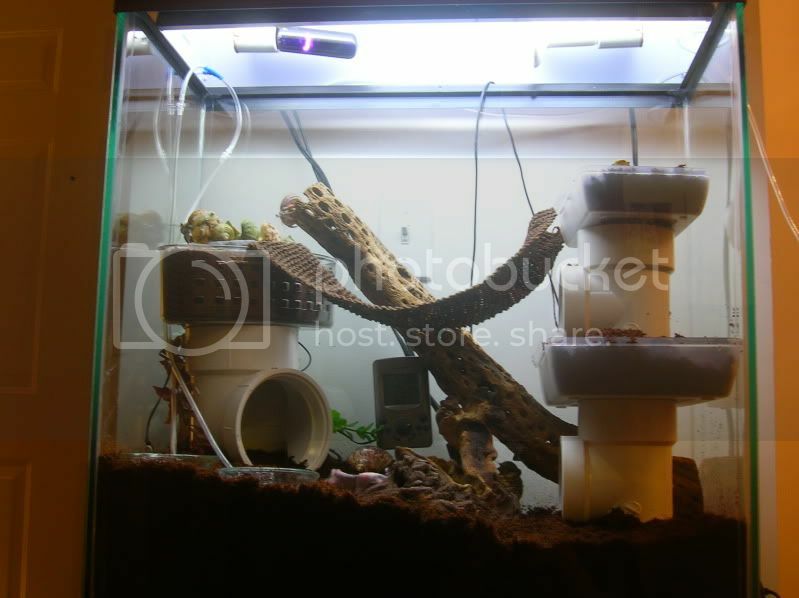 Pictures of the tank itself can be found on my photobucket: front of tank, right side, left side. Okay, so here's how we made the upper levels. The shower caddy one is made out of a shower caddy (suction cups that never actually stay stuck are removed), silicone sealant (we got a quick set kind that is ready to go in 3 hours), and a T shaped PVC pipe connector with an extender type piece that made it a bit taller. Use sealant to connect one end of the top of the T with the bottom of the shower caddy, and sealant the extender piece to the other end of the top of the T - you can adjust height at this time only, so choose wisely! 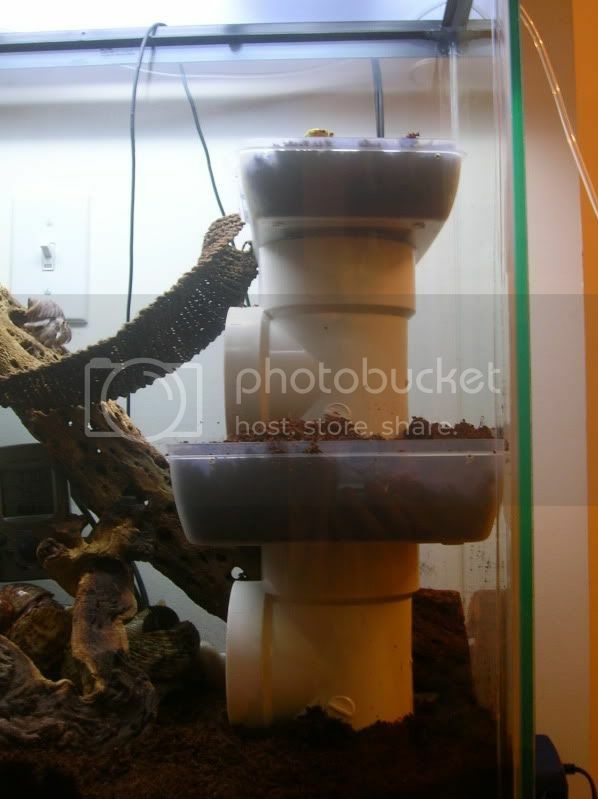 Let silicone set, and make sure when you put it in the tank you put enough substrate inside the upright tube that your crabs can go in and out with ease. The second upper level is made out of 2 pencil boxes (like you had in elementary school), one large and one small, and smaller versions of the PVC T connectors. Same concept applies - sealant to seal the top of the T to the bottom of the large pencil box, then silicone to seal the bottom of the inside of the pencil box to the next T's top. Silicone the T's top to the bottom of the small pencil box, let set. 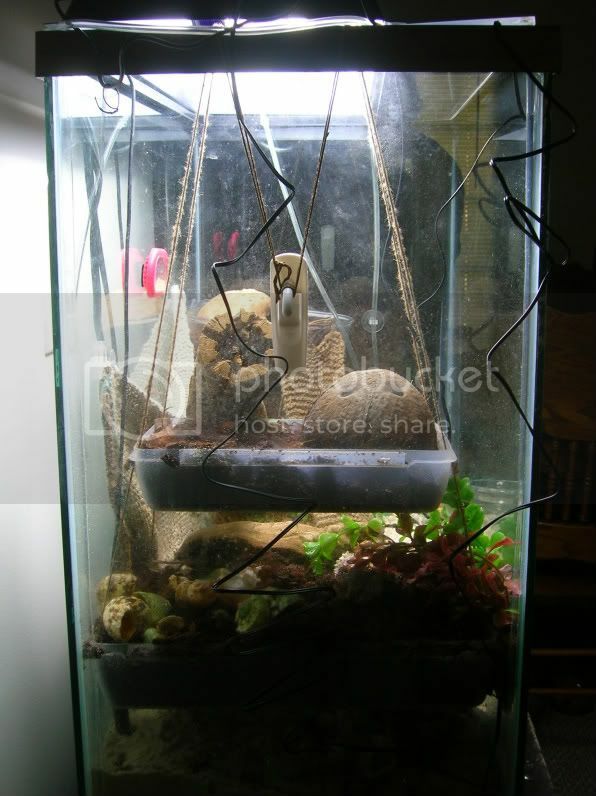 Again, enough substrate in the PVC so the crabs don't get stuck. The total cost for PVC pieces and silicone was about $57 at Lowe's, the shower caddy was about $5, and the pencil boxes were $1 total (clearance section at Walmart). Congratulations on your tank upgrades, and your successful deep clean!!! awww, what a nice tank! Wow! That looks great! I love all the tubes and stuff.